After a long while, I finally had the opportunity to try making my own Chinese-style bao burgers. The verdict? Pretty tasty and easier than I expected! 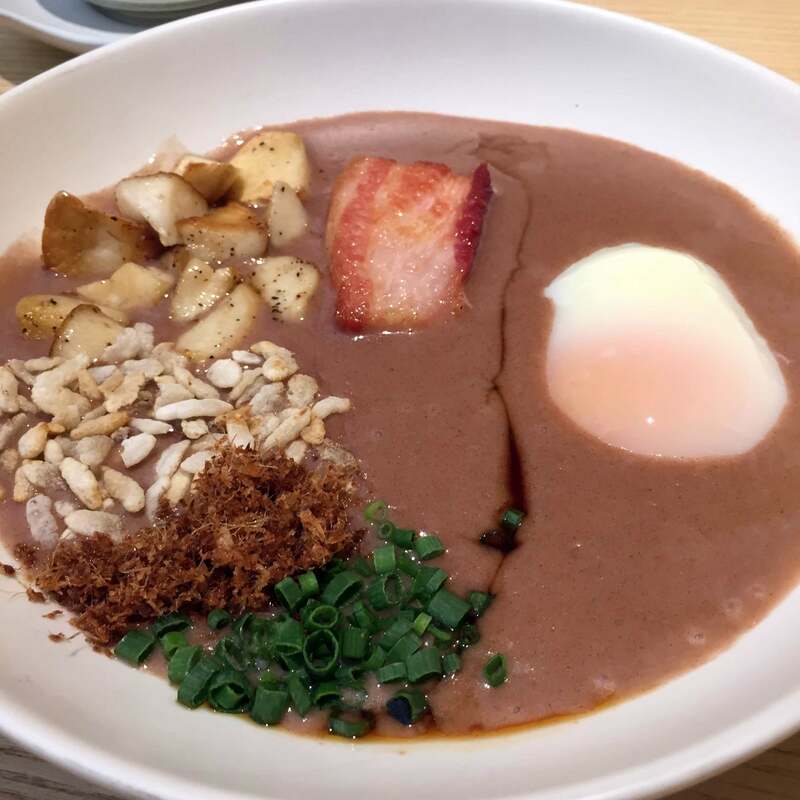 One of my favorite restaurants in the word is Little Bao in Hong Kong. (Read my review of it.) 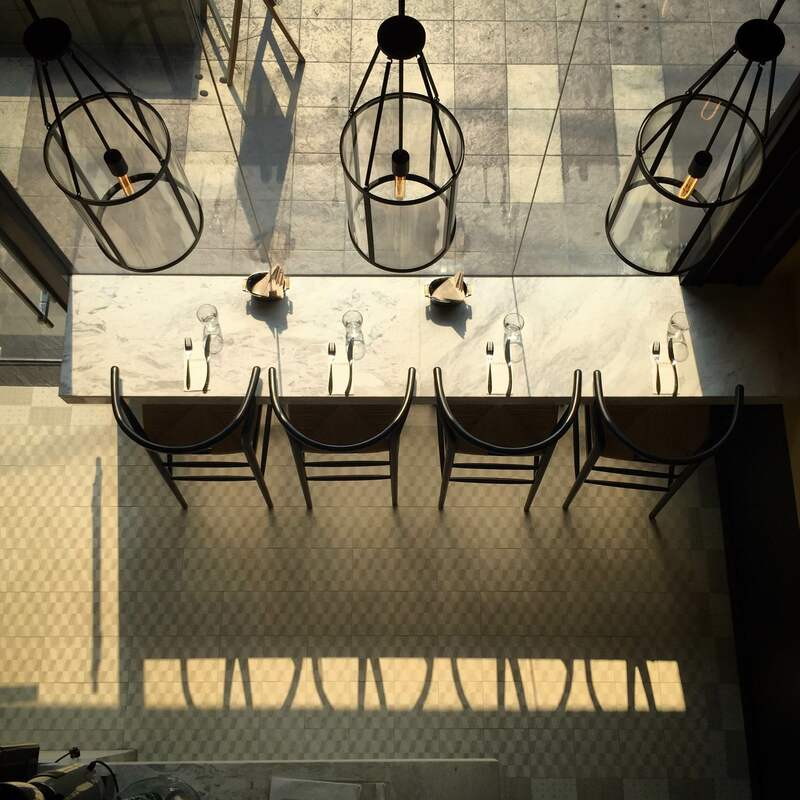 They are one in a crowd of restaurants doing more modern twists on the Chinese (specifically, Taiwanese) gua bao, steamed flour buns folded in half around pork belly, braised chicken, or other fillings. A spicy fried chicken with garlic black bean mayo and scallion coleslaw bao from Little Bao in Hong Kong. 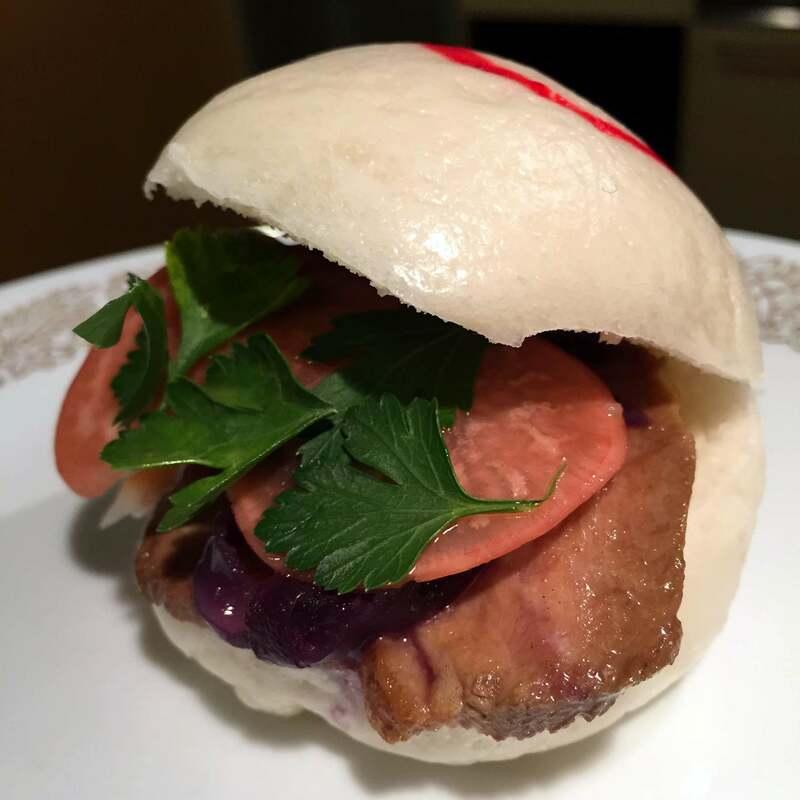 The conceit at Little Bao is that instead of a folded bun, they make their bao more like hamburger buns. This makes it possible to include more tasty fillings, offering a better balance of bread to filling. It was that hamburger-like quality that I wanted to achieve. 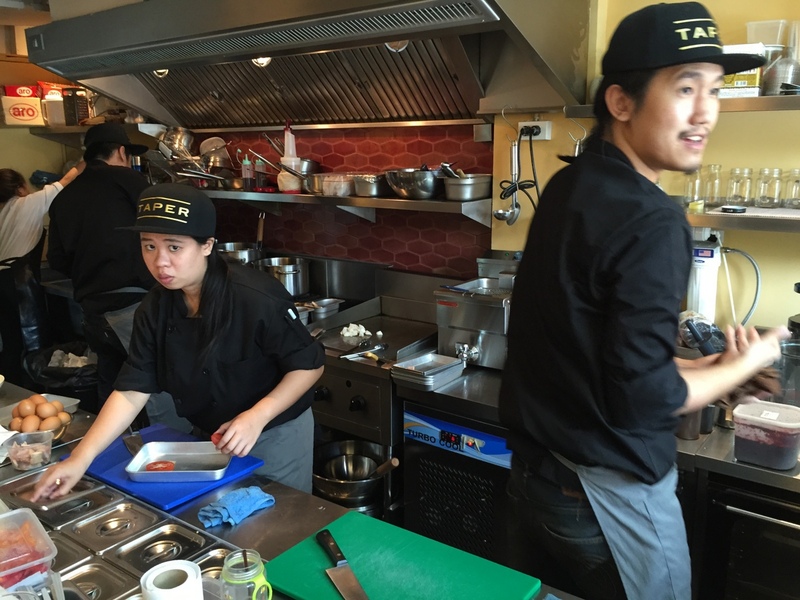 I worked with my friend Chow (aka the Bangkok Glutton), my frequent co-conspirator in the kitchen. 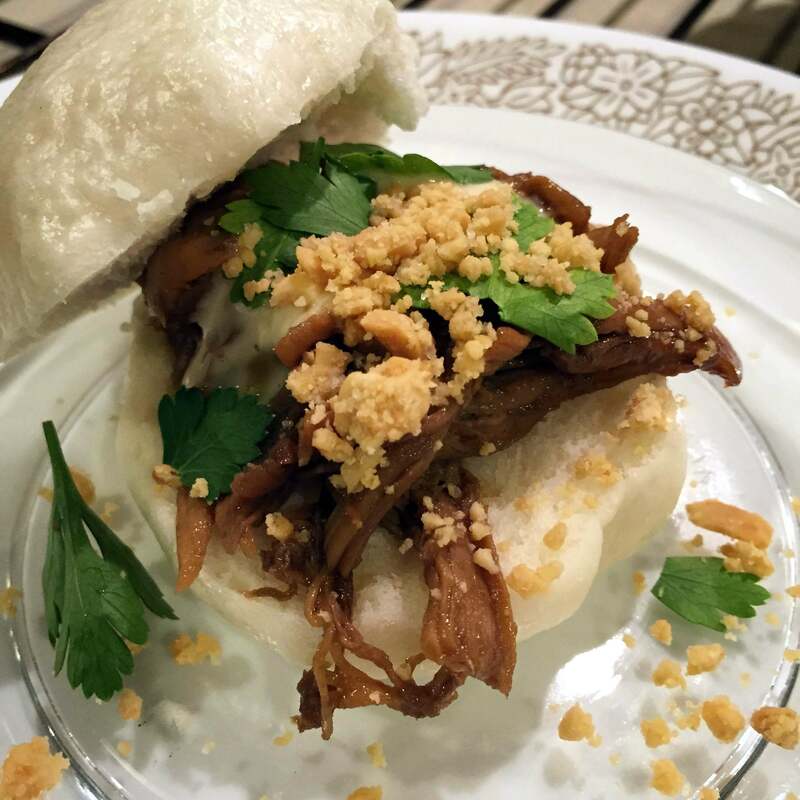 The basic recipe for the bao is simple: flour, water, yeast, a bit of baking powder and a bit of salt. Some versions have some milk added for softness – I didn’t try that this time. You let the dough rise a few times, punching it down between rises but trying to avoid over-working it, because bao are meant to be soft, not chewy. 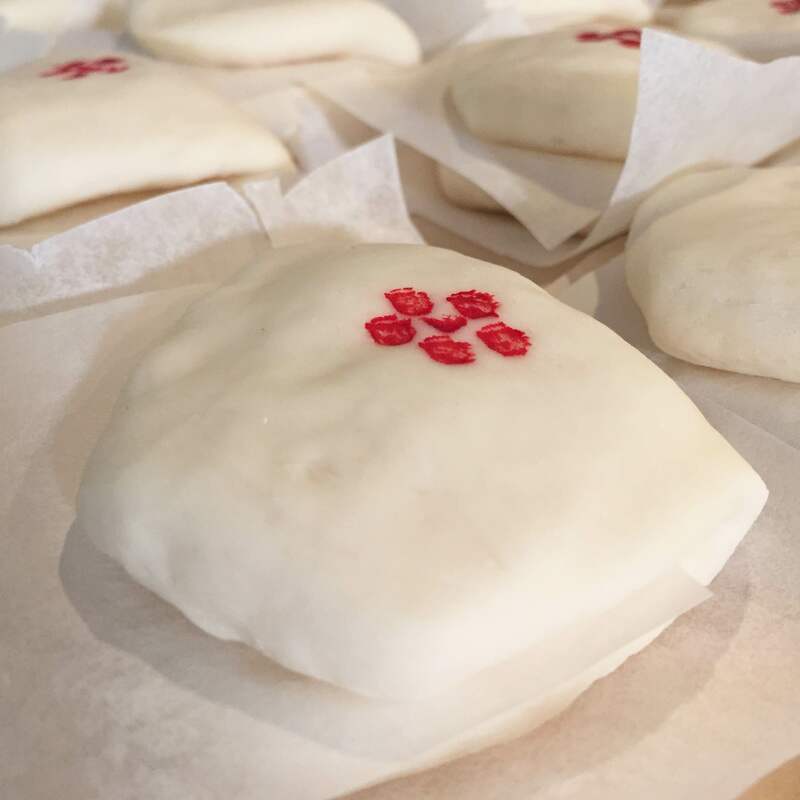 The first day, we made bao the traditional way, rolling them out into an oblong shape and them folding them in half over a piece of wax paper. This allows them to be opened and stuffed more easily. They are then steamed for about 8-10 minutes and can either be served warm or kept covered and reheated if necessary. As for the red decoration, I found that trick in one online recipe. You use red food coloring and the tip of a chopstick to decorate the buns just before steaming. Looks pretty professional! 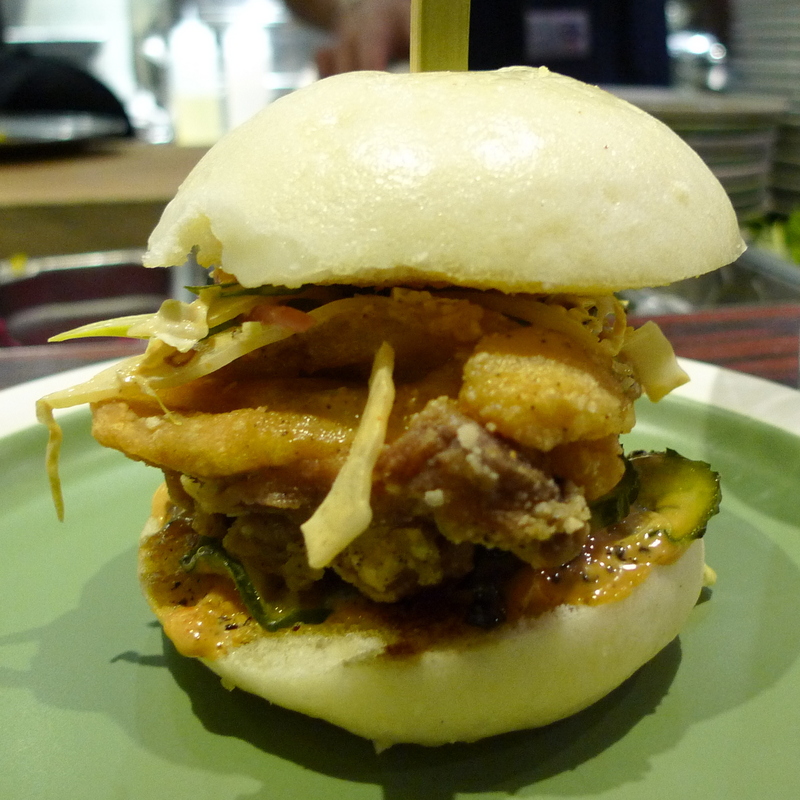 Our kitchen assistants became more creative and so we ended up with all sorts of designs on our bao. 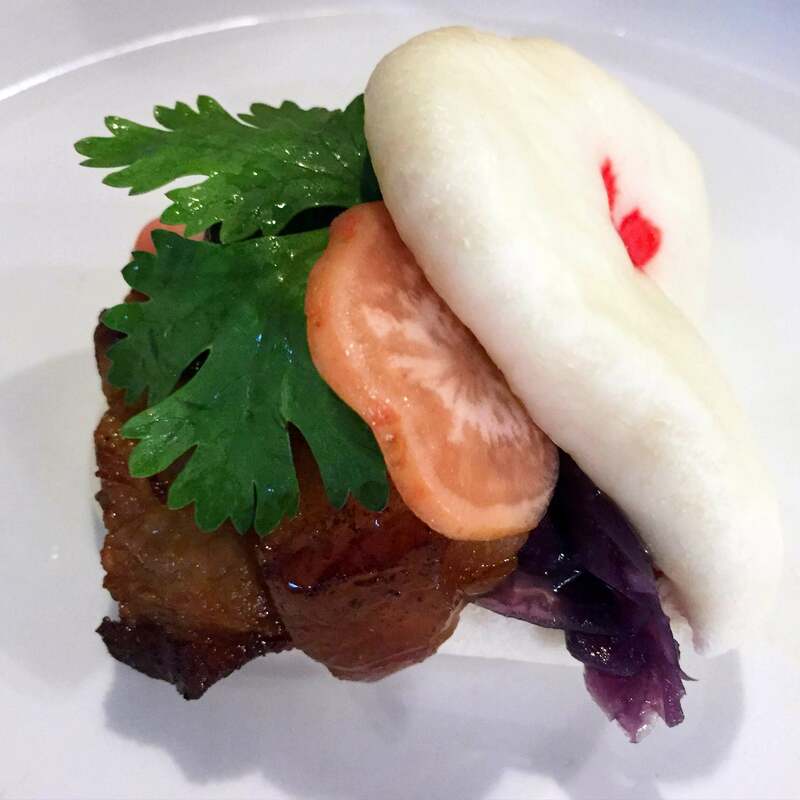 For the first day’s bao, we used some braised pork belly, homemade radish pickles, some braised cabbage, and some Italian parsley. 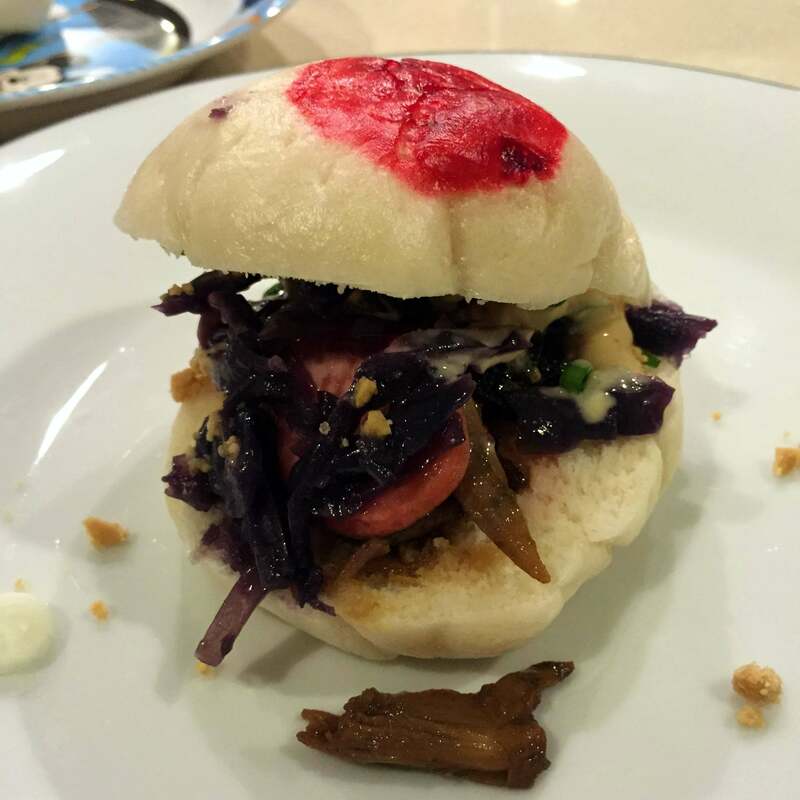 It turned out okay, but the bao were a bit flat, brittle at the fold, and the fillings were underwhelming in flavor. All in all, though, a good first attempt. The second day we let the dough rise more and also shaped it into balls, making it more like a hamburger bun. This worked better although I think we over-worked the dough a bit, as it was tough. The pictures don’t do justice, but the fillings were a great deal better this time around. We tried a different recipe for the pork belly, which had much more flavor than the original recipe. We also did a duck breast, which I paired with the seasonings I had used the day before for the pork belly. This, too, was very nice. The star of the show was a more traditional Taiwanese version with chicken thigh meat braised in Chinese rice wine and soy sauce served with chopped peanuts. 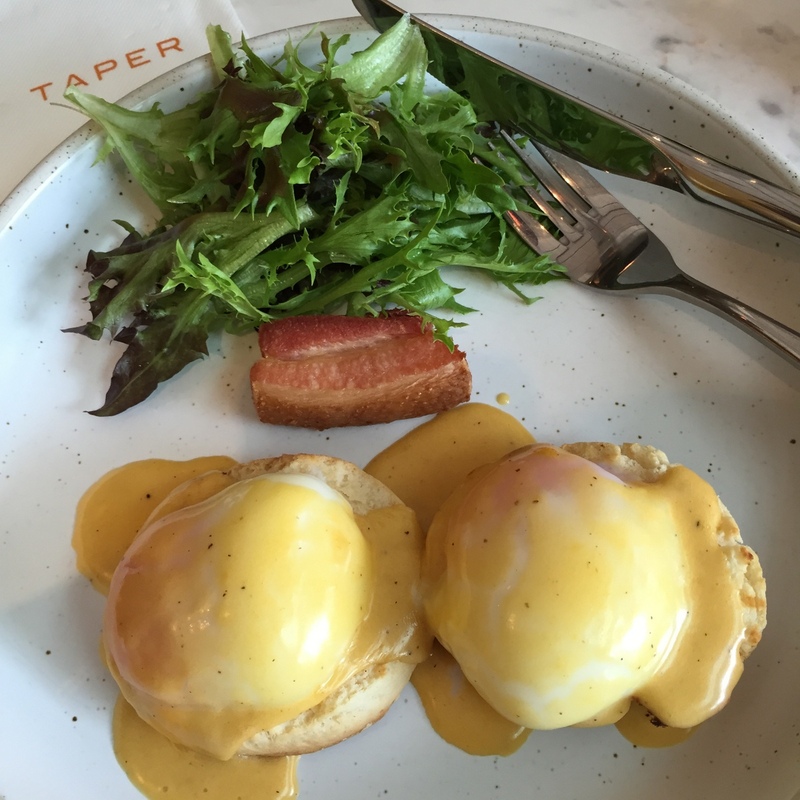 This was so tasty, I could have eaten a half-dozen and I will have to try it again soon. As an added bonus, since I was also teaching two friends’ children to cook, we made a homemade chicken noodle soup with both the broth and the noodles from scratch. 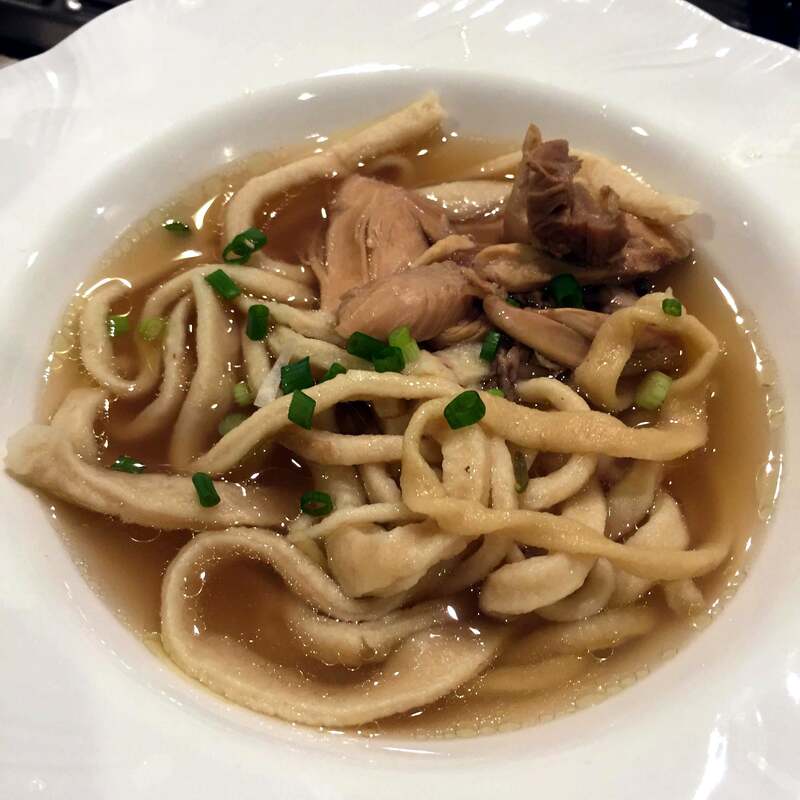 I think the noodles came out a bit too “spaetzle-like” but they were tasty and the broth was the first time I’ve made a chicken broth that really wowed me. Stay tuned for more from the kitchen. 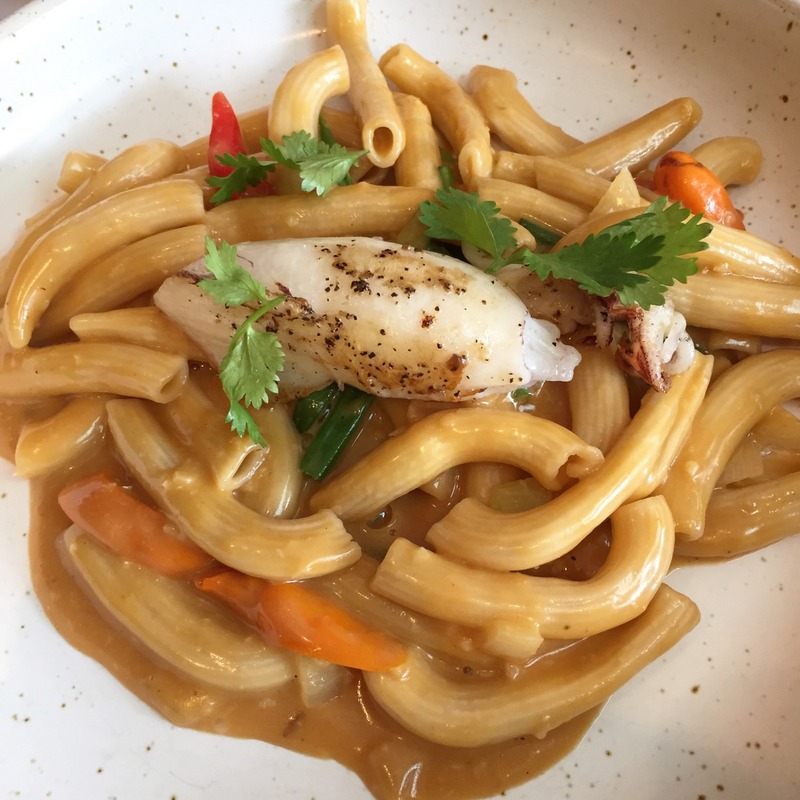 About two years ago, I asked Jarrett Wrisley, the American food writer and proprietor of Soulfood Mahanakorn and two other restaurants in Bangkok, what he thought the next food trend would be here in the City of Angels. His response: home style Thai food cooked by locals with really good quality ingredients and refined technique. He was spot on. 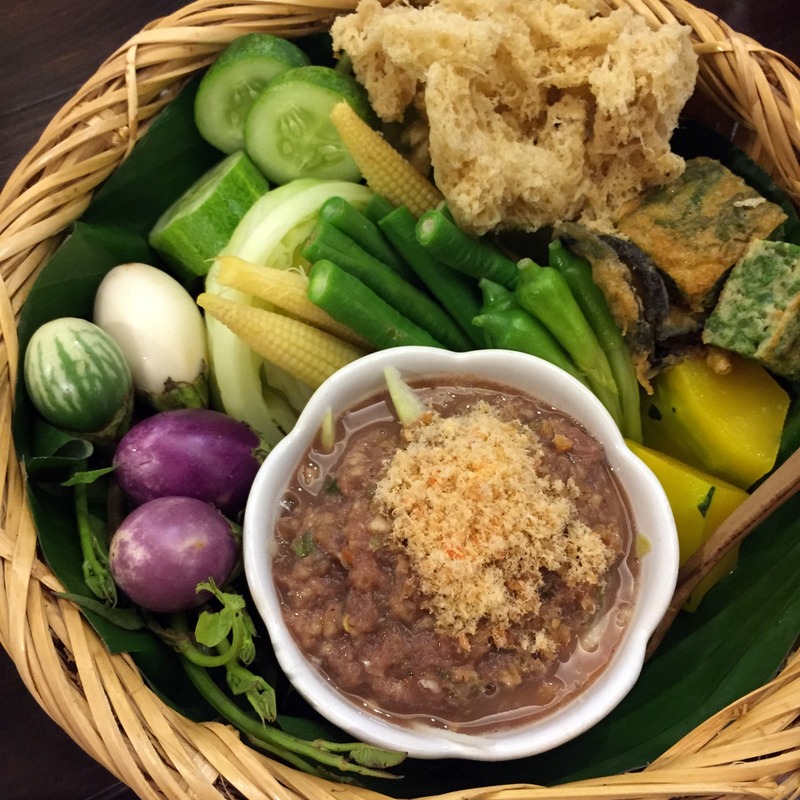 In 2014, we started to see more and more restaurants here in Bangkok that serve what you might call “Grandma’s food” – dishes that you rarely see most Thai restaurants serve, especially outside of Thailand. There are many places that are doing this trend well, and in this entry I visit Vanilla Home Cafe. 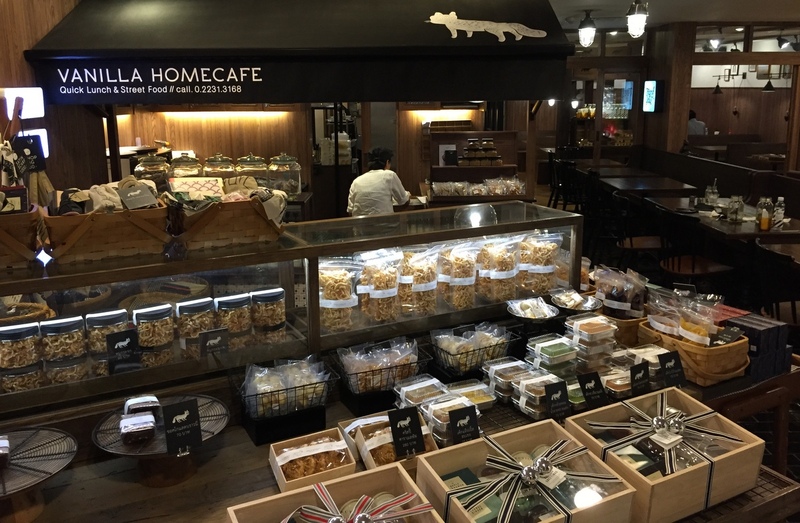 Located in the basement of the recently remodeled Silom Complex, Vanilla Home Cafe comes from the same family-run business that owns the S&P chain of eateries. Interestingly, some of the “Grandma’s food” menu items from Home Cafe are making their way onto the S&P menu, which I count as a good thing. 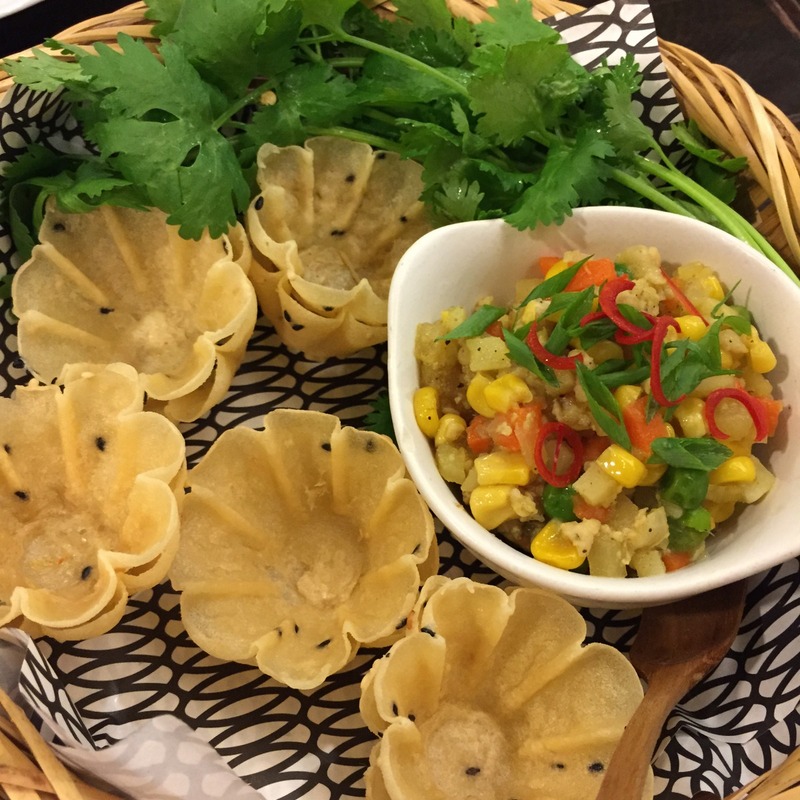 Appetizer of Gratong Tong – crispy golden cups with minced chicken and sweet corn. This isn’t the rarest of dishes but is one that be a candidate for the endangered list. Crispy cups with a chicken and corn relish. What’s not to like? 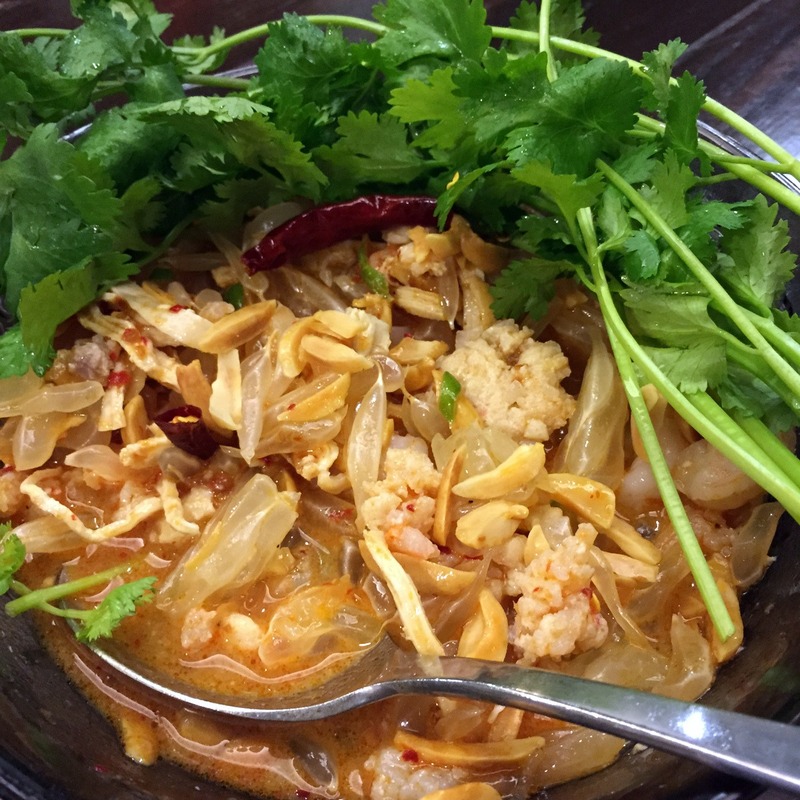 Yam som-oh – pomelo salad with a dressing of lime, palm sugar, fish sauce, shallots, and chilies. This is also pretty common. The “yam” style salad can be made with countless ingredients but the pomelo version is one of my favorites. Perfect balance of flavors and not too sweet. Naamprik mamuang gunghaengbon plaasalidpuu – green mango chilli relish with crispy fish. 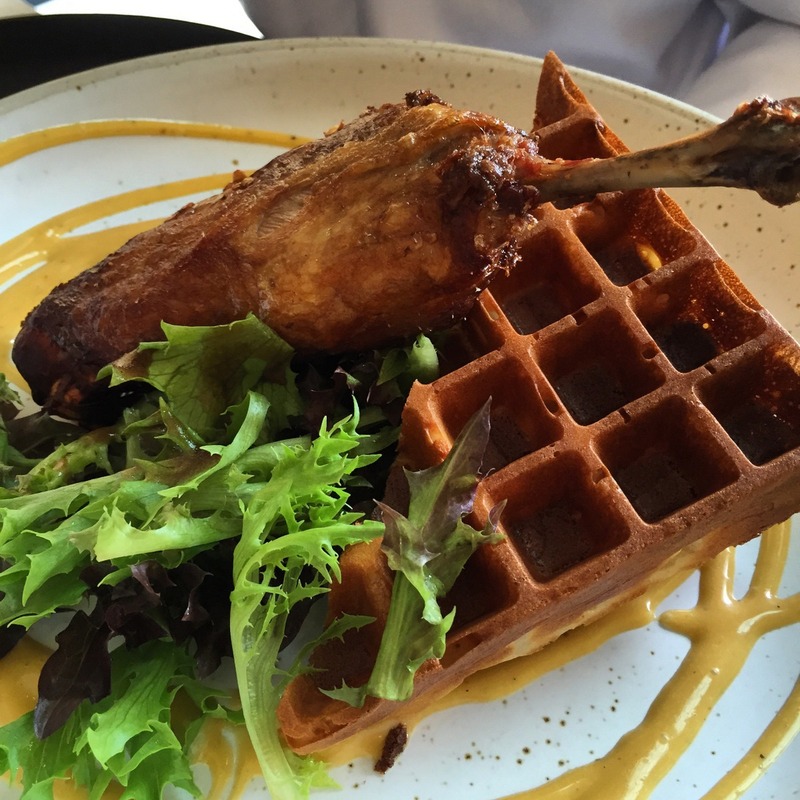 The “naamprik” is really the dish that set this “Grandma’s food” trend in motion. There are many different versions of this dip, all of which are served with blanched vegetables and other condiments. Some are fiery, others not so much. This version with green mangos has a really nice balance of flavors. Spicy, but with just a small amount with some veggies to cool the fire, it is fantastic and fantastically healthful. 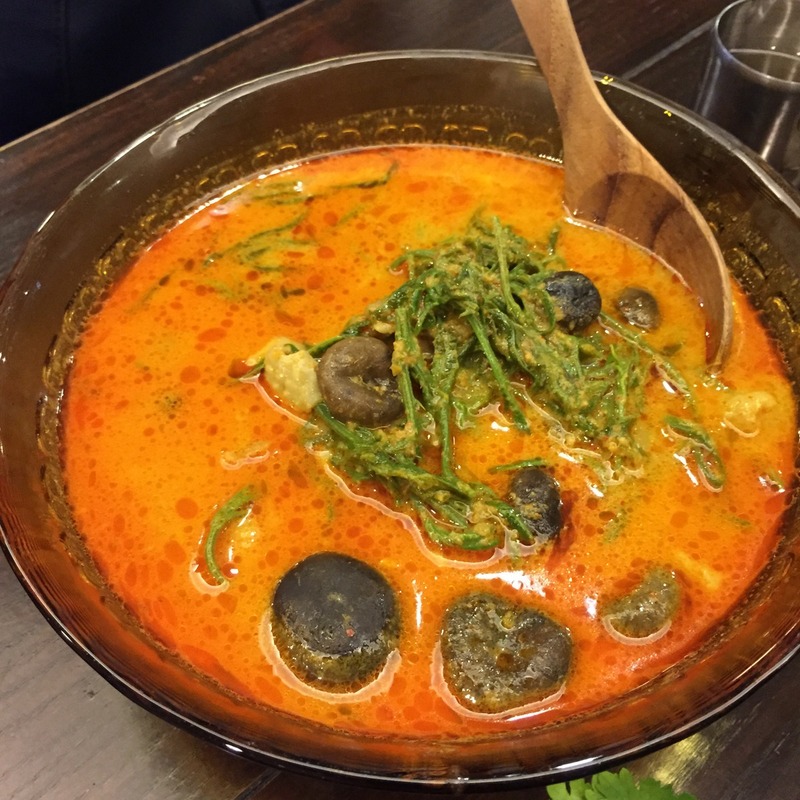 Gaeng kuahaed paw – Earthstar mushroom curry, a forest mushroom in a rich curry that isn’t as spicy as you might expect. Served with an interesting local green that has the same effect as asparagus on your urine’s smell. 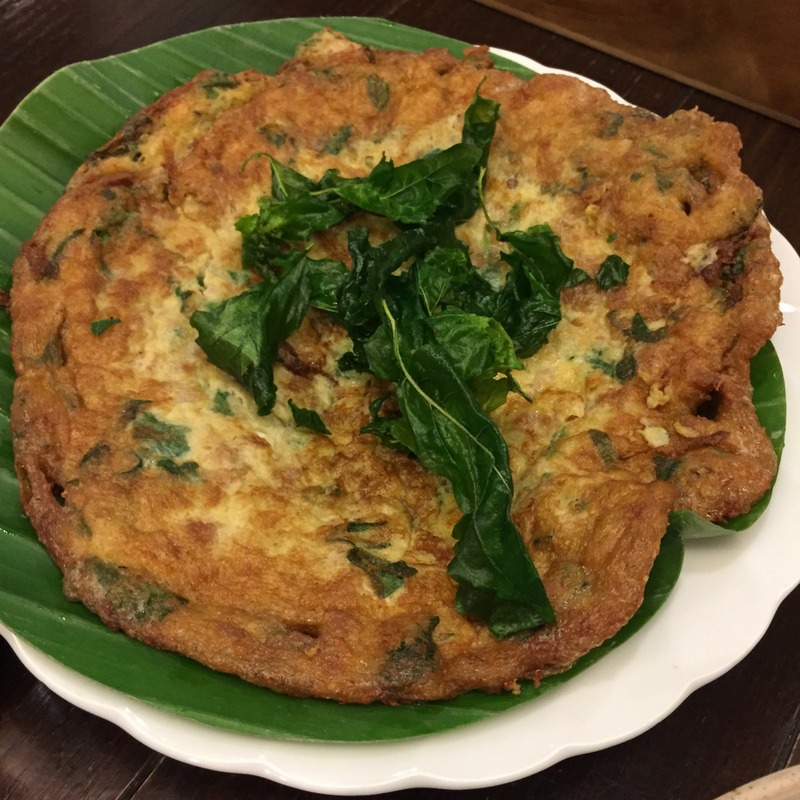 Kaijiaw gapraw muusap – minced pork with chili and basil omelet. Probably the most common dish but a classic that grandma would be remiss not to serve! 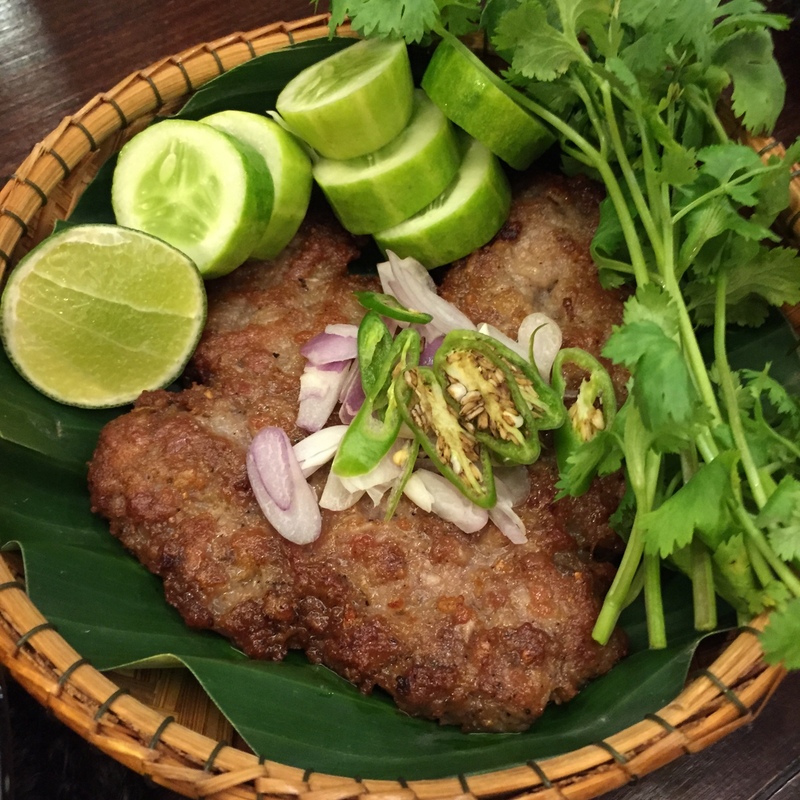 Muutod plaakhem – deep fried pork patty with salted fish. Yes, at first you think it is just a pork patty. And then you taste the salted fish. And the chilies. And the shallots. And the lime. And the coriander. Wow, there is a lot of flavor going on here! Plaahaeng taengmo naamkaengsai – crazy obscure dessert. 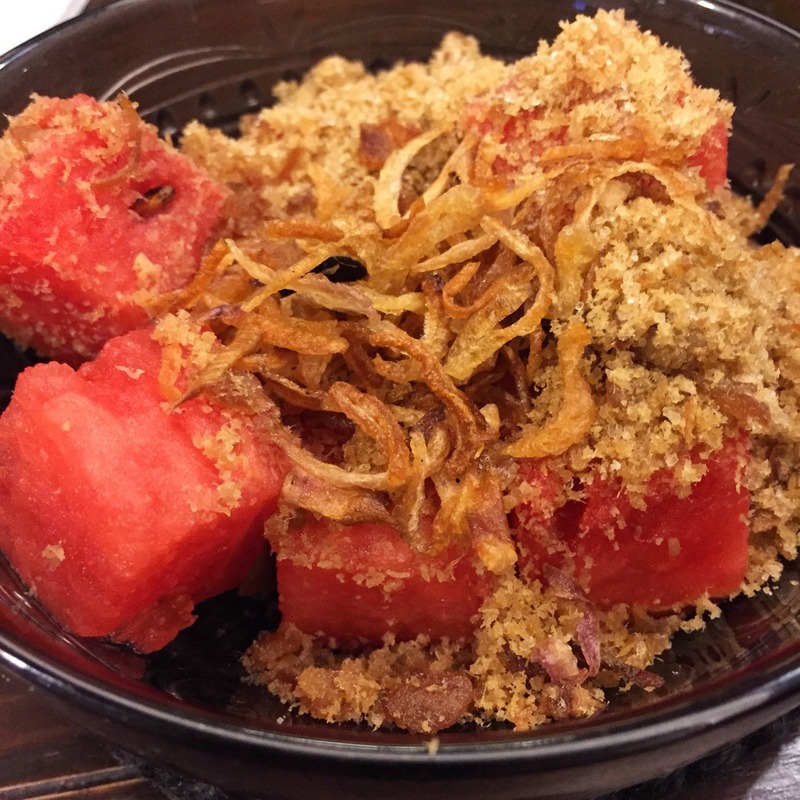 Perfectly ripe watermelon served over crushed ice with dried fish. Yes, you read that right. Think of it this way: you know how sweet watermelon and salty feta cheese is all the rage these days? This is the non-dairy version of that flavor combination. Location: Basement of Silom Complex, adjacent to Saladaeng BTS station in Bangkok.